Hello and Happy New Year! This week instead of saying I hope your week is off to a good start I'll say I hope your year is off to a good start! I always love the start of a new year because it always gives you the opportunity to reset your life, your diet, your faith journey or whatever needs "resetting". It's a fresh slate and another chance to be who you want to be! I have a lot of goals for this year. Some of them are to create more, learn new tips and techniques and to blog more! 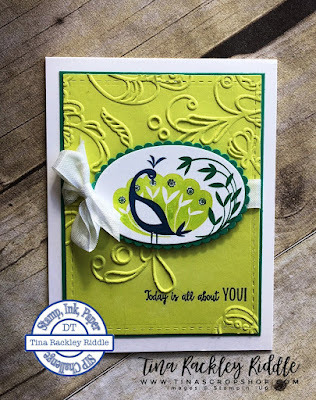 I love that I'm on the Stamp, Ink, Paper design team because that gives me the opportunity to not only make a card each week but also to interact with some fabulous paper crafters on the Design Team! 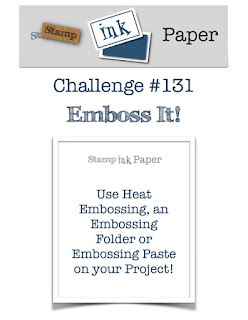 This week's theme at Stamp, Ink, Paper is all about embossing and there is a lot of inspiration for you to check out! As you'll see from the Graphic it can be any type of Embossing! Well today I don't necessarily have a new tip or technique but I do have a new card with a brand new stamp set that will be available to customers on January 3rd! It's also a completely free stamp set available with a $50 purchase during Sale-A-Bration! I also have a new favorite color... Lemon Lime Twist. I know.. I know.. I'm late to the party. So many people have been loving this color. If you're one of those people, I've just jumped on the band wagon with you. I'm loving it too! As usual, I have to throw in something a little old! The embossing folder is a retired Stampin' Up! folder and I have no idea what It's called but I love the Florishes on it so I used it on my Lemon Lime Twist Background panel! Oh and here's the thing about Lemon Lime Twist.. I love it with Dapper Denim and Emerald Envy! I think they all work together soooo well! Since today is about embossing, I also heat embossed the sentiment. I stamped it in Versamark Ink and then Dapper Denim Ink and it stayed sticky enough to clear emboss! I love heat embossed sentiments! If you are interested in any of the products below is a listing.